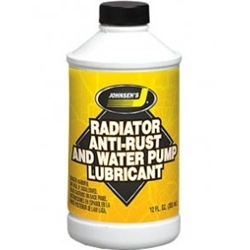 Radiator Treatment and Water Pump Lubricant Johnsens 4618 / BOWES CH 4618 12oz Bottle. Formulated to help in the prevention of rust and corrosion in automotive cooling systems. this product may be used in all cooling systems. Designed to protect aluminum , copper, iron and other parts of the cooling system.